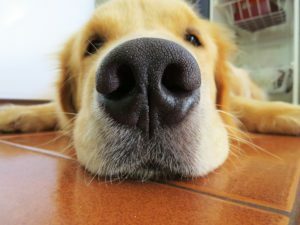 Does your dog seem like a super snoozer? Why do dogs sleep so much and how long do dogs sleep everyday? It seems that if your dog isn’t doing something fun, they are sleeping. How can our dogs possibly sleep as much as they do? Dogs can sleep anywhere anytime. I am going to discuss how long most dogs sleep every day, and what is causing them to sleep so much. Can you imagine if just for a day, we could get as much sleep as our dogs do, how rested we would feel. It is actually amazing how our dogs can possibly sleep as much as they do. The amount your dog sleeps will vary on a few factors. The breed of dog you own, the age of your dog and if your dog is a worker dog or a companion dog. The average amount of sleep that an adult dog sleeps in a day is 12 – 14 hours each day and if your dog is an older dog it will be even a few more hours. Puppies sleep even more than adult dogs at around 16 – 18 hours per day, and large breed dogs like Mastiff and Great Danes sleep closer to 16 -18 hours per day. Dogs will spend 50% of their day sleeping, 30% they will spend resting where they are awake but are inactive, and approximately 20% of their day being active. Working dogs will sleep less than the family dog. They are being more physically and mentally active than a dog that is just hanging out in the house. Also, dogs that believe they are watchdogs of your house will sleep less. They believe they need to alert you to every sound that they hear. First, it is completely normal for most dogs to sleep a lot during the day. Dogs sleep whenever they get the chance to sleep. Dogs don’t have a regular sleep schedule like we do, but are rather flexible sleepers. They wake up easily and become alert immediately. If the doorbell rings, they can easily popup and be on full alert. There are several reasons why dogs sleep as much as they do. Boredom – If your dog doesn’t have anything going on to entertain them, or if there isn’t anything going on, your dog is going to sleep. It is important that you make sure that your dog gets plenty of physical activities and mental activities to help them with dog boredom. You can also make sure that your dog has plenty of interactive toys to help keep them entertained. More active dogs will sleep less. Dogs don’t sleep as soundly as humans do, or for as long. Dogs wake up many times during the night. They may jump off your bed during the night, get a drink of water during the night, and change places where they are sleeping. Aging dogs increase their amount of sleep since they aren’t able to be as active as they once were. You might notice that they start moving around more during the night, as it isn’t as easy for them to get comfortable. It is important that you get your dog a comfortable, proper bed for your dog as they age. Their joints will get more sore. You can take a look at my recommendations for the best dog beds for older dogs by clicking on the link. There are get recommendations for whatever sleeping style your dog has. REM sleep is important. Being deprived of REM can cause unpleasant effects. It is key to mental and overall well-being and health. REM or Rapid Eye Movement is when the brain activity increases and we dream. Dog’s REM period is shorter than it is for humans, which is part of the reason that they need to sleep often in order to get all their required REM sleep. 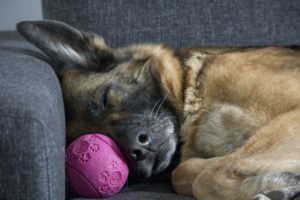 You need to be concerned if your dog suddenly changes their sleeping habits and seem to be sleeping quite a bit more than they normally do. If you notice a big increase in the amount they are sleeping, you should speak with your veterinarian to see if there is a medical reason for the change. 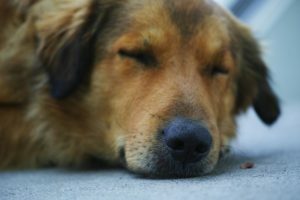 Here are a few of the reasons why your dog could be increasing their sleeping. Dogs are inactive 30% of the time. Low quality diet. Food that doesn’t have enough nutrients that your dog is requiring for his energy can cause increase sleeping. They are harder to digest and force your dog to spend more energy digesting their food. If this is the case, it is an easy fix by providing your dog with a more quality diet. Poor health. Your dog could have a heart condition, diabetes or an under active thyroid gland. For an under active thyroid gland, your veterinarian can prescribe a medicine that will greatly help. 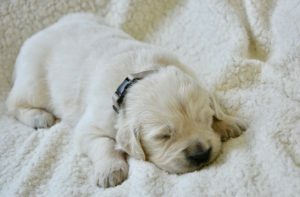 One of my Golden Retrievers had this, and he had really increased his amount of sleeping and was gaining more weight. There was a big difference in his energy and personality once we got him more stable. Life changes. If your dog has lost a companion or had a big move, your dog will need extra sleep to get their mood and energy level back to normal. If it seems that you have a dog that is excessively sleeping but is eating well and full of energy when they are awake, you should have no worries. Because dogs don’t have as long of a REM period as we do, it is important that when they are sleeping that you don’t interrupt their sleep if possible. Let them snooze when they need it. Dogs need a place of their own for sleeping during the day. At night, they might be sleeping in your bed, but during the day, they will want to be where you are but still have a comfortable place to take their nap. Provide them with a dog bed, blanket or their crate available if that is where they are comfortable. It should be an area that is off to the side, so you aren’t falling over them as you are moving around. I truly think it is wonderful having a dog sleeping at your feet or next to you, so I am not complaining about how much dogs sleep. I enjoy seeing my dog comfortable and asleep. Also, a sleeping dog isn’t getting into trouble. 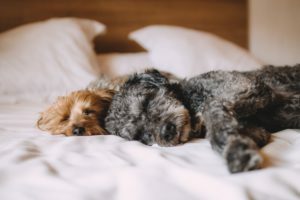 You now know why do dogs sleep so much and how long do dogs sleep and that you don’t need to be concerned unless your dog drastically changes the amount of sleep they are requiring. If they have big increase in their sleeping habits, you need to figure out why. Talking with your veterinarian is the best place to start that discussion. You also might notice that sometimes when it seems that your dog is asleep, they aren’t really. I had a dog that was a great pretender of sleeping. If I would get up from the couch, I would find my dog quickly crawled up in my warm spot and would tightly close his eyes. I knew there was no way he was sleeping, but I guess he realized that if he pinched his eyes tight enough, I wouldn’t disturb him. Dogs are smart enough to believe they can trick us. If you have any questions or comments, please leave them below. You can follow justforyourdog.com on Pinterest, FaceBook or Twitter. I am glad it could help. It is amazing how long our dogs can sleep for. I used to be concerned that there was something the matter, but I have come to realize that they really do enjoy relaxing.